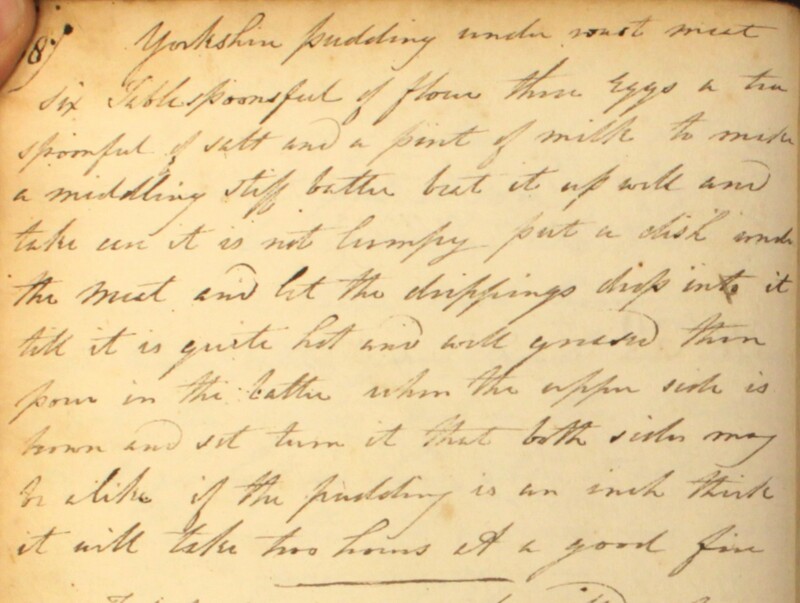 We last looked at ‘collaring’ when we put together a Regency menu of beef and Yorkshire pudding for St George’s Day. 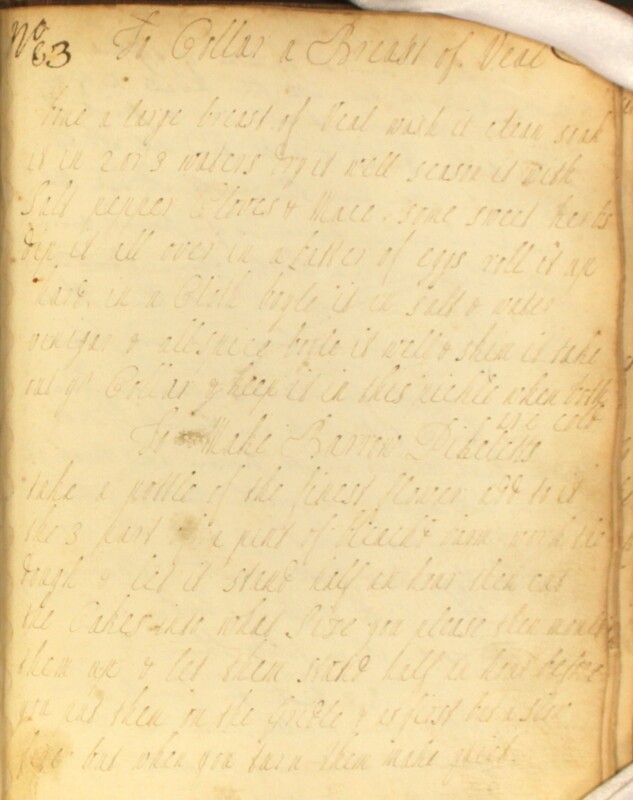 Today’s first two recipes use the same technique of tightly rolling and binding meat, which is then pickled for use at a later date. Take a quarter of brawn, lay it in salt three days. Then take some all spice, cloves & mace & season it. Boyle it in a cloath very soft with some vinegar, salt & water till it be tender. Then rowl it over new with another cloath & fresh tape as hard as possible. Then let it be cold. Then boyle yr pickle with some brawn with a little fresh water. Let it be cold & keep ye brawn constantly in it tyed up. Make fresh liquor once a fortnight. 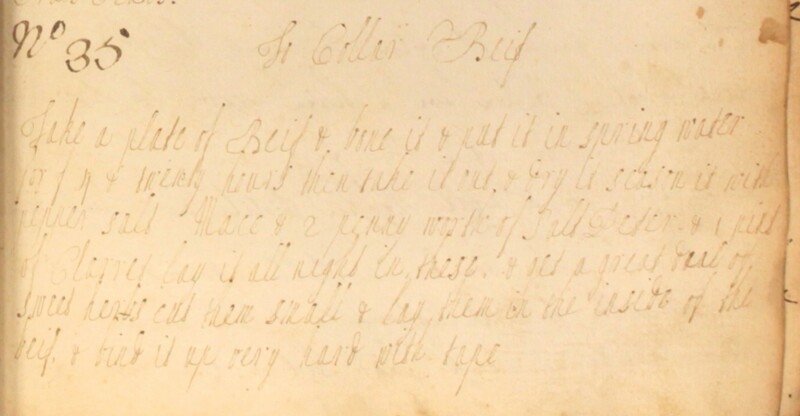 18th century recipe “to collar a breast of veal” from The Cookbook of Unknown Ladies. Image property of Westminster City Archives. Bone a large breast of veal, wash it clean, soak it in 2 or 3 waters. Dry it well. Season it with salt, pepper, cloves & mace, some sweet herbs. Dip it all over in a batter of eggs. Roll it up hard in a cloth. Boyle it in salt & water, vinigar & allspice. Boyle it well & skim it. Take out yr collar & keep it in this pickle when both are cold. Take a breast & neck of mutton, bone it, spread it on ye dresser. Take ye yolks of 3 eggs boyled hard & shred small, half a lemon peel shread, 3 anchoves shred, some shives, thyme, some pepper & allspice pounded. Strow these all over ye in side of ye meat but first rub ye in side with the white of an egg. Then clap the breast on the neck & roll ym up hard with a tape & cloth in a collar. Bake it in a crok with white bread, fill’d up with water & cover’d with paste. When it coms out, take it out of ye crok & let it lye till next day in ye cloth. Then take it out & cut it in 3 collars the height of yr hand. 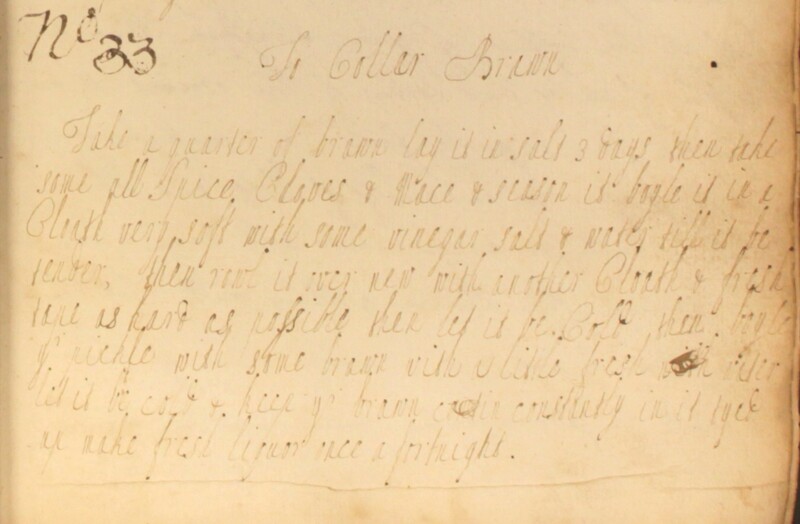 Then toss up a sauce of strong greavy, white wine, anchoves shred, lemon peel & onion, thyme & parsley, pepper, all spice, a lump of butter roll’d in flower. Toss these up together, then heat the collars in it. You must have a good deal of liquor, for you must allow for waste in heating yr collars. Garnish yr dish with slices of lemon & red cabbage. 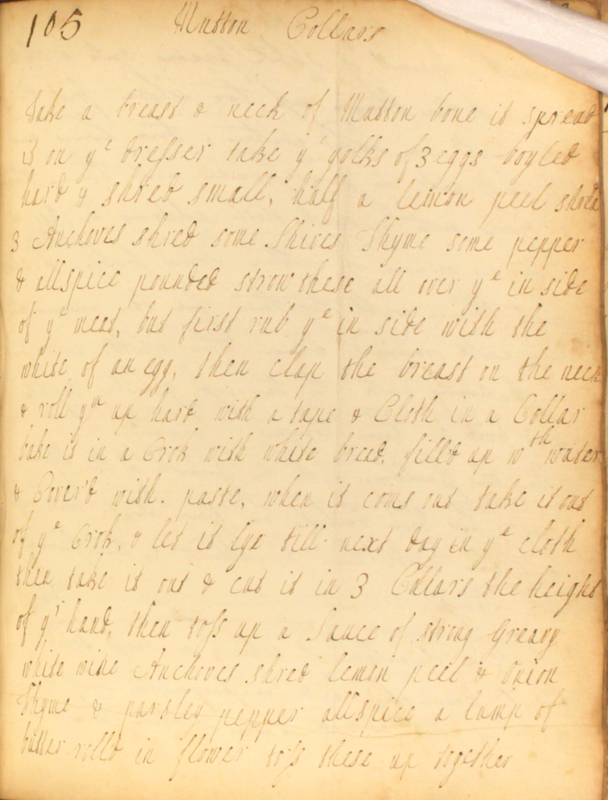 There’s some lovely imagery in this recipe – the meat being spread out on the kitchen dresser, the ‘clap’ as one cut is laid on the other for rolling… Further clues as to what work was like in the kitchens of our ‘unknown ladies’.